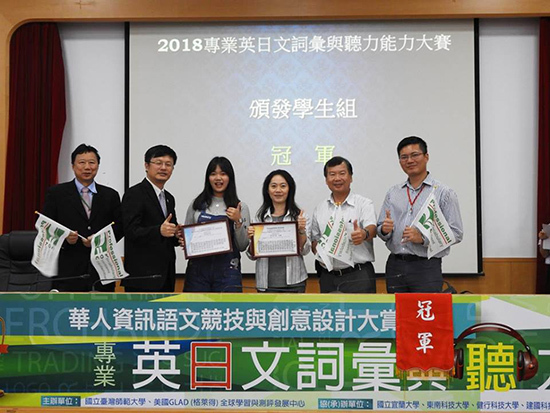 Southern Taiwan University of Science and Technology won three championships in the 2018 Professional English and Japanese Vocabulary and Listening Proficiency Competition for the Second District of South Taiwan. 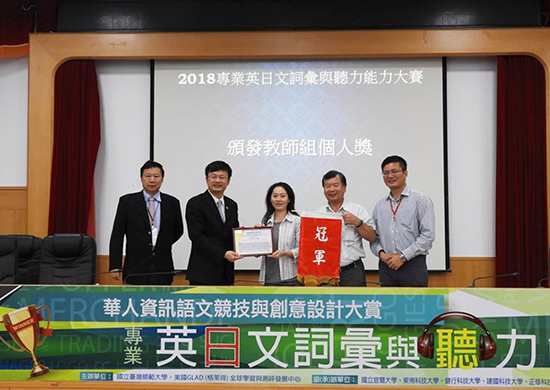 The Department of Applied English, Southern Taiwan University of Science and Technology, participated in the 2018 PVQC professional English and Japanese vocabulary and PELC listening Proficiency Competition, sponsored by National Taiwan Normal University and the GLAD Global Learning and Evaluation Development Center. The team won the championship of Business Management Vocabulary Teacher Group as well as the first three places in both the Business Management College Student Group and the Professional English Listening Vocational University College Student Group. Their performances were brilliant and amazing. The PVQC Professional English and Japanese Vocabulary and Listening Proficiency Competition was held by the National Taiwan Normal University and the GLAD Global Learning and Evaluation Development Center, with the purpose to enhance the English and Japanese listening and vocabulary skills of students in the workplace, to effectively bridge the gap between learning and using, and to establish an international core competence in professional languages on the part of students. 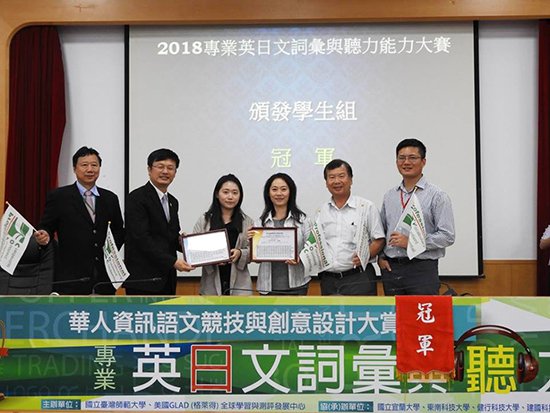 In the regional competition of the Second District, Yi-Zhen Cheng, directed by Prof. Ching-Rong Yang of Applied English Department, Southern Taiwan University of Science and Technology, won the championship in the individual Business Management Competition with an almost perfect score. The runners-up, Zi-Ying Chen and Bai-Zheng Liu, were tied in their performances, and Yi-Hong Liu won the third place. This was the first time the department entered the vocabulary group competition. Prof. Yang integrated nearly 1,400 words from the business management into her class of Basic English Business Communication and conducted intensive training on students for about ten weeks. In the competition, the team, consisted of the top four students participated in the regional competition of the Second District. In order to encourage students to participate, Prof. Yang also signed up for the regional competition teacher group competition. Under the encouragement of teachers and students becoming comrades-in-arms, the team showed great performances in its first vocabulary competition. Prof. Ching-Rong Yang has directed students in the professional English listening competitions for four years. They have won individual championships and group championships of college student groups in the national competition over the recent three years, including three gold medals, silver medals, and two team championships and two runner-up trophies. This year's victory in the regional competition in the Second District was still eye-catching. Shin-Shuan Lin won the championship with an almost perfect score, Zi-Ying Chen and Bai-Zheng Liu shared the runner-up, and Jia-Shuan Yeh and Yan-Li Jiang were tied for the third place. Gui-Rong Chen, Chair of the Department of Applied English at Southern Taiwan University of Science and Technology, said that the department is committed to cultivating students' practical ability to increase their employability after graduation as well as actively guide students to participate in international certification. 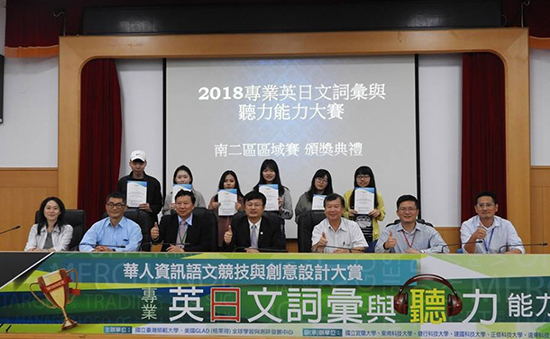 The team will represent the Second District University to participate in the national competition held at Taiwan Normal University on January 24, 2019, and continue to strive for greater glory.